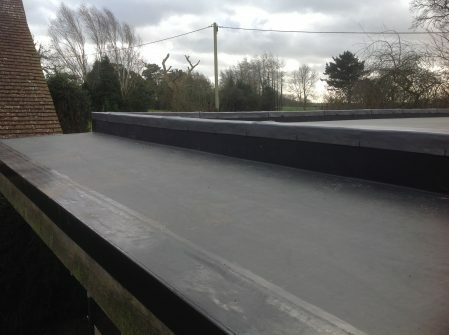 SUMMARY: A good example of the application of RubberBond Fleeceback EPDM in an eco-home installation. Church Yard Cottage is a privately owned detached home in the village of Liphook, Hampshire. Constructed 6 years ago as an eco-home (designed and built using materials and technology to reduce its carbon footprint), the original roof was completed using a GRP system, which due to incorrect installation, was leaking. The home owner was looking for a new solution to replace the faulty roof and make the property watertight for years to come. Appointing an experienced roofing contractor to carry out the work was important to the home owner, who wanted assurances that the installation would be professional and it would be backed by robust warranties. 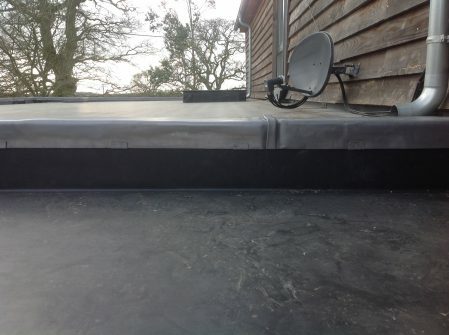 DPM Leadwork Ltd was chosen as the contractor and recommended RubberBond Fleeceback EPDM which has a long service life and can only be installed by approved roofing contractors, giving the homeowner confidence in the outcome and its longevity. The existing GRP roof was leaking and required immediate attention; the surface had cracked and couldn’t be repaired. Following their previous roofing experience, the home owner was looking for a different solution which would ensure the roof would remain watertight for many years to come and looked to DPM Leadwork for their advice. DPM Leadwork is an experienced roofing contractor and approved RubberBond EPDM installer, giving the home owner complete peace of mind that the new roof would be fit for purpose and installed correctly. RubberBond Fleeceback EPDM was chosen as the preferred roof covering due its exceptional waterproofing capabilities and flexibility. In addition, its contemporary appearance was in keeping with the rest of the property. The roof construction included a complex skylight and consisted of a ply deck with OSB3 boards covered with a vapour control barrier, tapered insulation with tissue facing and RubberBond EPDM. The 50m² of RubberBond was installed in large sheets which joined seamlessly to give a completely watertight finish. To complete the installation to a professional standard, the edges were finished with metal Plastisol trims and lead flashing. By using RubberBond, DPM Leadwork met the home owner’s eco-friendly requirements; it has a low environmental impact with a long service life and is energy efficient, reducing heat usage by absorbing UV radiation and it does not contain any toxic substances. DPM Leadwork was able to take advantage of the technical support offered by Flex-R, who is the sole distributor of RubberBond EPDM in the UK. Flex-R’s product experts supplied a complete materials list and attended site meeting to ensure measurements were taken correctly, which gave DPM Leadwork total peace of mind throughout the project. 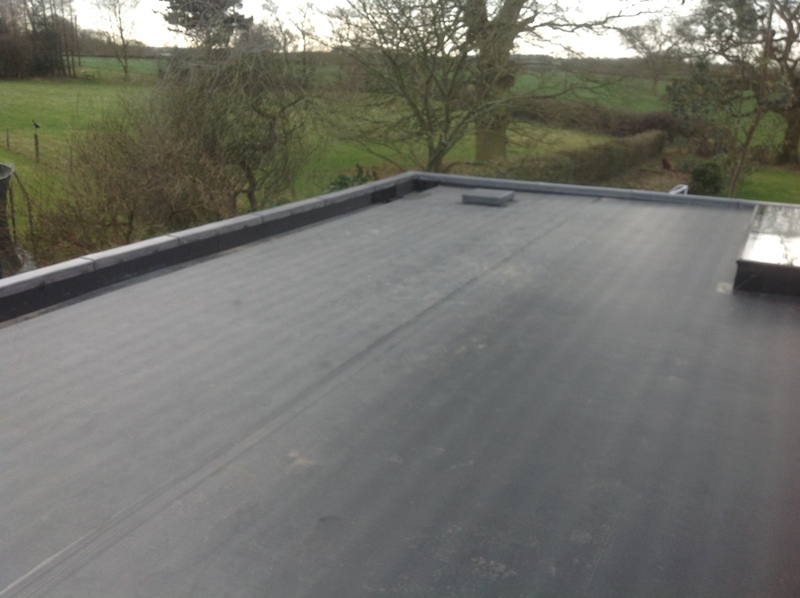 This RubberBond EPDM roof installation will ensure that the roof will last for many years. RubberBond has BBA Certification stating under normal service conditions, the system will provide a durable waterproof covering with a service life of at least 35 years. The system is UV stable and does not suffer from cracking or crazing over time and because there are no plasticisers that can migrate, it will remain flexible over its service life. In fact, the roof will change little in appearance over its lifespan, so the homeowner can be assured of an outcome that will look the same as the day it was installed. DPM Leadwork could rely on Flex-R’s technical support which helped to ensure that the project was completed on time and in budget. The eco home has a new environmentally friendly roof which will keep the property watertight and look ‘as new’ for many years to come. RubberBond can be installed over existing aged roof coverings reducing the need for land fill and its long lifecycle means that manufacture energy requirements are reduced compared to the installation of systems that require replacing more frequently. The home owner was really pleased with the finish achieved and the service received, enjoying the confidence that the product is backed by a 20 year warranty.